New book, 80 pages, DUE18. The Gulf War bore witness to a number of deadly encounters between these two great adversaries. Heavily armored, highly mobile and capable of killing at over 2500m the M1 Abrams is, to this day, a veritable fighting machine. Superior to both Iraq's Soviet era T-55 and T-62 tanks, nearly all sources claim that no Abrams tank has ever been destroyed by enemy fire. 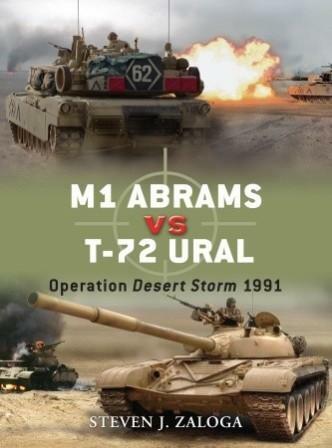 Despite entering service in 1980, the M1 Abrams remained untested in combat until the Gulf War in 1991, where it was to be confronted by its archenemy the Iraqi-assembled Soviet-designed T-72. Entering production in 1971, the T-72 arguably outstripped its contemporaries in a balance of mobility, protection and firepower. By the time of Operation Desert Storm, however, the tables had turned and the tank suffered due to low quality ammunition and poorly trained crews. In this fascinating study, Steven Zaloga pits these two great fighting machines against one another, plotting the development of the Cold War until both tanks met in combat in the deserts of Iraq and Kuwait. This item was added to our catalog on Tuesday 01 November, 2011.